Yes! Finished the exercise and submitted it to CC for what will probably be a right royal chewing! I’m not even sure if I followed the rules or not as appreciation of parts of speech and flying participles (or was that buttresses?) was obstinately non-stick at school, predating teflon by some considerable margin. I’ve always written rather more by feel than by knowledgable construction and so can come unstuck, to pursue the metaphor (or is it an analogy? You see my problem? ), when push invariably comes to shove. Anyway, all that can come of this enterprise is deep humiliation or the satisfaction of not drawing attention to myself as I have no doubt that the other contributors will have delivered on both accuracy and wit. I did come in bang on the word count though, which is an achievement in itself as my capability with English grammar outshone my mathematical naus by many many astronomical units. And if they’re not called Angsts then they should be! I’ll put Prune-Ella on the nano page once the fur and feathers have stopped flying and the bleeding is under control. 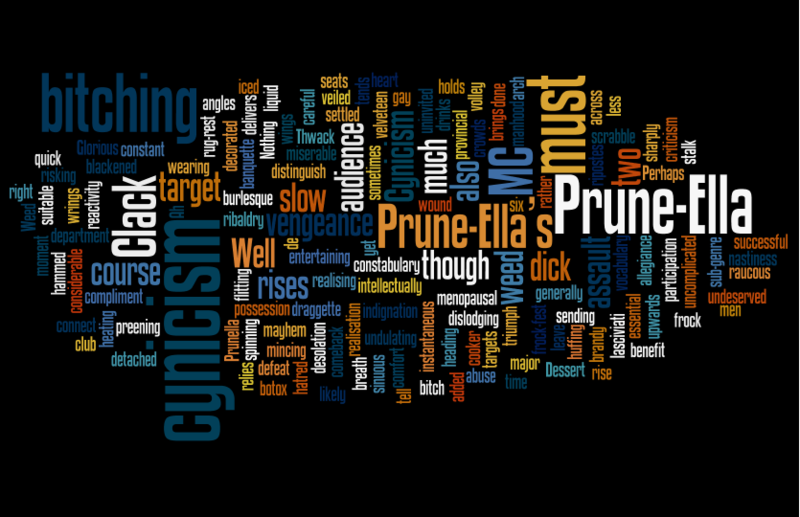 I made a wordle though….